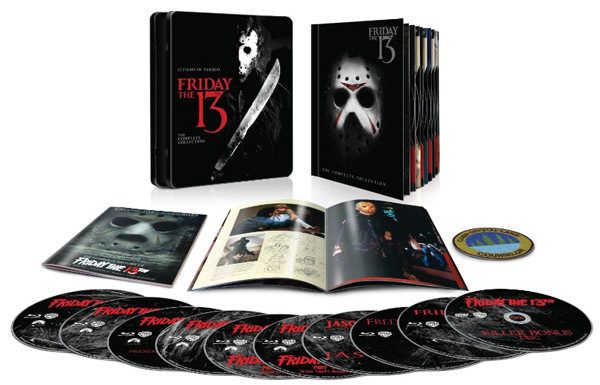 Not too long ago, Paramount re-acquired the rights back to the Friday the 13th franchise and you can believe fanboys were geeking out and gearing up for what was to come: All the Friday the 13th titles, for the first time ever, under the same roof -- and a complete box set with all the films, up to the remake (previously, Paramount only had the right to distribute the first eight films). And so it shall be. To be released on Sept. 13 (yes, a Friday), the collection will be a 10-disc set, with the 12 films on nine Blu-ray discs with that leftover disc to be chockful of bonus feature goodies. So what’s this beast gonna look like? Well, no worries, because it didn’t take them long to push out an image! 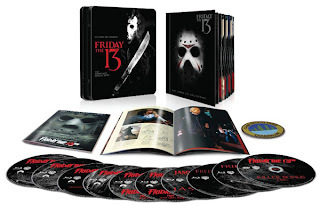 Inside this collectible tin set, you will also get a 40-page, soft cover booklet of inserts from the Crystal Lake Memories: The Complete History of Friday the 13th. But that’s not all! Dust off your Boy Scout shirt and add a Camp Crystal Lake Counselor patch to that! Also, by the look of things, they seem to have stuck with the whole, put-your-discs in a booklet type of thing (the previous box set from 2011 was the same type). Some fans may be disappointed to know that first eight films are HD transfers from a few years ago, so they won’t include anything new (this reportedly goes for the bonus disc as well). Jason Goes to Hell, Freddy vs. Jason, Jason X and the remake may also be HD transfers with nothing new, but possibly new disc menus. This shouldn’t turn off any Friday or horror movie fan because Jason is home and finally under one roof!